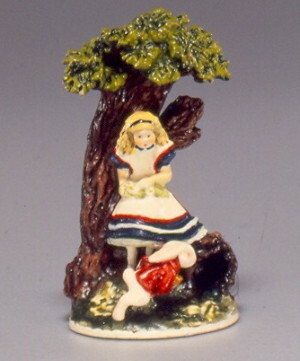 HISTORY: This is the second of three figurines in the Alice in Wonderland Series. Production was limited to 5,000. GENERAL: Alice is on the bank under a tree when all of a sudden this rabbit runs by and dashes down the hole. He had just taken a yellow watch out of his waistcoat pocket and exclaimed, "Oh dear! Oh dear! I shall to too late!" Alice has thrown up her arms and is almost speechless. The rabbit is captured in this split second of time. Once again, Bob had only word pictures and images from a book to use. So much must come from imagination. How would this rabbit look? The book describes a white rabbit with pink eyes, so he was dressed in a red jacket. Alice had to be dressed with the same red trim on her dress as in "Alice in The Garden," but Bob backed her up against the tree to hide the troublesome white bow in the back of her dress. Another question for Bob: "How big do I make this tree?" He had never tried to carve anything as big before. He decided to use a highly textured tree with leaves to make the piece visually interesting and use the same base tone as in the first "Alice." Where to put the hole? The base of the tree would be a perfect location. Notice that a real hole was made, not just a painted opening. The tree was the symbol of stability here and the flash of the red and the diagonal position of the rabbit denote direction and action. Notice that the tree trunk leans towards the motion. Painting her little shoes gave the painters a bad time. They were so tiny and hard to reach. In the "Cheshire Cat" (the next figurine to come), Bob placed her feet farther apart to solve the problem. Note also the shadow painted underneath the rabbit. SIGNED: In the back under the tree in an allocated place. SPECIAL NOTE: This is a closed, non-numbered, limited edition of 5000. A "Process Stick" was made to depict the production process. Below is an image of the steps involved in creating Down the Rabbit Hole. For more information about the process sticks, click here.